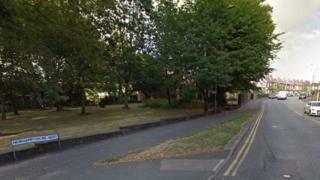 Two teenage boys suffered serious injuries when a car "deliberately" mounted a kerb and hit them, police said. The pair, aged 16 and 17, were struck in the hit and run on Newhampton Road West, Wolverhampton, at about 20:00 GMT on Thursday. They continue to recover in hospital, West Midlands Police said. Officers believe a dark VW or Audi was damaged in the crash. No arrests have been made. Investigating officer Det Con Sarah Lewin said: "We are treating this as a deliberate act and urging anyone who saw what happened or has information on who was involved to get in touch with us. "A dark car, possibly a long saloon VW or Audi, hit the teens and then drove off without stopping. The car is likely to have damage to the front and be very noticeable."